The SRCA 2010 annual meeting and conference was held in Fair Haven, Vermont, Friday, September 10th and Saturday, the 11th, 2010. Cost was $200.00 per person - spouses and girlfriends were free. We reserved all the rooms at the Marble Mansion, the Haven Guest House and the Maplewood Inn. We started with the Camara Slate Company in the morning, then toured Greenstone Slate in the afternoon. In between, we went back to the Fair Haven Inn for lunch generously sponsored by Greenstone Slate Company (Jon Hill). 2) Friday Evening Slate Valley Museum Reception, 7-9 pm: We invited the local Vermont slate industry community to our SRCA "meet and greet" open reception in nearby Granville, NY from 7-9 pm. There was wine, heavy hors d'ouerves and live music, plus a tour of the museum. This event was generously sponsored by The Durable Slate Company (John Chan and Gary Howes). The music duet was generously sponsored by Greenstone Slate Company (Jon Hill). 4) Saturday Morning Refreshments - all morning: These were generously sponsored by the12th Century Slate Roofing Company (Doug Raboin). This included non-alcoholic drinks, refreshments and snacks for the conference attendees at the Fair Haven Inn during the meetings and presentations. 5) Saturday Conference Lunch (12:30 - 2 pm): Food was provided by the Fair Haven Inn, well known for its fine cuisine. This lunch was generously sponsored by Camara Slate Products, Inc., Fair Haven, VT (Shawn Camara). 6) Saturday Afternoon Historic Roof Tour (2-5 pm): We went out and looked at some of the old slate roofs in the area, including some of the oldest documented existing slate roofs in the USA. 7) Saturday Social Hour Before Dinner, 7-8 pm: We had a social hour at the Fair Haven Inn after our historic roof tour, prior to dinner, with an open bar sponsored by Vintage Slate (Clay Heald), appetizers sponsored by Evergreen Slate Co., Inc. (Tom Collard), and live music sponsored by Greenstone Slate Company (Jon Hill). 8) Saturday Evening Dinner and Music, 8-10 pm: Fine food, friends and fun at the Fair Haven Inn. The dinner was generously being sponsored by Camara Slate Products, Inc., Fair Haven, VT (Shawn Camara). The three-piece band was generously being sponsored by Greenstone Slate Company (Jon Hill). 9 am to 5 pm, Friday, September 10th: The theme for this year's conference was Slate Quarrying. We toured two SRCA member slate quarries on Friday, September 10th: Camara Slate Products, Inc. and Greenstone Slate Company, followed by a reception that evening at the Slate Valley Museum. Saturday Afternoon: Historic Slate Roof Tour, 2-5 pm- No sense sitting in meetings all day when we're in the Slate Valley of Vermont and had the opportunity to see some of the historic roofs in the area, such as the 1851 roof on Scotch Hill, or the 1860 roofs with the dates in the slates. We car pooled and enjoyed an adventureous suprise tour under the guidance of Shawn Camara. 9 am to 12:30 pm Saturday, September 11th: We had our Board and General Membership Meetings from 8 am until approximately 10:30 am. Powerpoint Presentations took place from approximately 10:30 am until approximately 12:30 pm on the morning of Saturday, September 11th, at the Fair Haven Inn, followed by a catered lunch sponsored by Camara Slate. The Board Meeting and the General Membership Meeting were followed by the presentations listed below. Saturday, September 11th: 10:30 to 11:00 am - John Chan of Durable Slate: John Chan-Fazio Residence, Baton Rouge, LA. A storm chaser came and installed a new slate roof on the Fazio Residence in the spring of 2009. During the installation, the Fazio's had 2 large leaks causing approximately $200,000.00 of interior damage. The roof was finished, but the Fazio's were upset by the "look" of the slate and also that the roofing contractor couldn't stop the leaks. In May of 2010, the Fazio's had enough of it and hired Durable Slate to figure out the leak above the "breakfast room." We tore off 1 square of slate and re-installed it with the correct flashings and stopped the leak. In the process, however, we discovered used slates, slates with 1 nail, caulked in broken slates, repair slates with no nails held in by friction, etc. 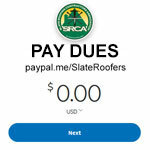 The Fazios were incensed and decided to replace the slate on the whole house, because the insurance company wouldn't cover them anymore, because of the "substandard roof." When we replaced the roof, we found more of the above, as well as extreme over and under nailing of slate, unsoldered flashings, missing flashings causing rotten plywood, improperly installed vents allowing carbon monoxide and methane back into the house, etc. The slate was picked up and re-layed. 11:00 to 11:30 am- Gary Howes of Durable Slate: St. Peter's Catholic Cathedral, Jackson, MS: When Hurricane Katrina came through the Gulf area, the church and steeple lost lots of slate and the steeple itself was damaged. St. Peter's called 3 roofing companies from the Gulf region and both of the other companies suggested removing the steeple and installing a flat roof in its place. The church officials hated the idea, but thought they'd have to remove the steeple or install a fiberglass steeple that was lighter in it's place. Durable Slate came in and correctly established the problem. We rebuilt the interior wood structure of the steeple, restored the exterior masonry with a matching hydraulic lime mortar, and re-slated the steeple. 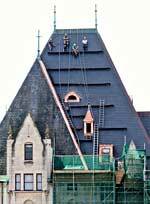 We also repaired the chapel and rectory slate roofs. 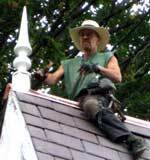 The church was extremely pleased that their steeple was saved and that their roofs have been restored. 11:30 to 12 Noon: Joe Jenkins of Joseph Jenkins, Inc.: International Federation of Roofing Trades (IFD) Congress and the World Slating and Tiling Championships: The SRCA is now a member of the IFD and we will be attending the 2010 Congress in Belfast, Northern Ireland in November. This presentation will show and discuss two previous IFD events, one in Dublin, Ireland and one in Edinburgh, Scotland, so members can see what it's all about. The IFD has 23 member countries - this is its 58th Congress. The SRCA will have a time slot during the conference to address the delegates and introduce them to our organization. Any SRCA member is welcome to come to Belfast with whatever Board members are going. This will be an important topic of discussion during our Board and Member meetings. 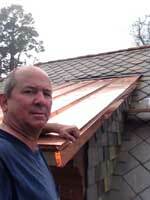 12 Noon to 12:30 pm - John Chan of Durable Slate - Copper Roof Job: Thomas Holmes built a three-story Queen Anne-style hotel at the corner of Main and State Streets in Westerville, Ohio in 1889. This became the city’s “Landmark.” Unfortunately, this historic landmark was struck by lightning in the 1950s, and the bell shaped dome that once adorned the main intersection of Westerville was removed. Luckily, the current owner of the building located an old postcard of the building. Although the old postcard had no close up details that would enable an exact duplication, it was very important to the owner, that the general character, shape, and proportions were the same. To achieve the rounded-appearing surface, a 14-sided roof was constructed. T&G wood was cut and screwed into position for the decking material. 17 rows of copper panels were cut. This diamond panel system was all locked into place with copper cleats. Adorning the peak is a custom fabricated 5 foot tall finial with a lightning rod system. It was installed to ensure against a repeat lightning strike like the one in the 50’s that robbed the city of the distinct look of their landmark.